A very well organised trip, I would recommend redspokes above other companies who run this route. The reason being the quality of leadership, back-up, the food and an itinerary which allows for better acclimatization. Oh, and we had a superb group! Fantastic trip.....Fabulous and breathtaking views! Painful at times and yet sweetness absorbing the views. Walker a great guide and really attentive Nepali and Tibetian crew and the group makes this trip memorable!!! The Tibet tour was an experience that will make me smile again and again. 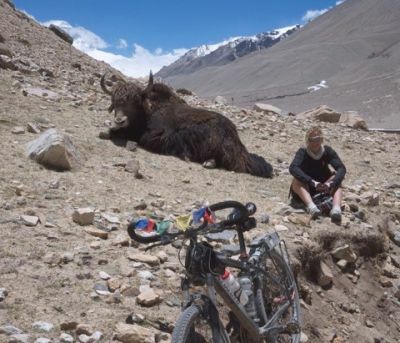 We were very lucky on our tour with the weather conditions, but luck wasn't the only thing: the teamwork and flexibility between the tour leader (David) and the Nepalese and Tibetan crew to ensure we all had a fantastic time was unsurpassed. The food was better than I cook for myself at home and the the camping had a hint of colonial luxury. I cannot recommend redspokes more highly. This was one of the most spectacular trips I have ever been on! The scenery was varied, awe inspiring, amazing people, very unique culture and environment. The trip was very well organised with a daily routine of: wake up to bowl of hot water, eat yummy cooked breakfast, ride all day with lunch prepared for us : ), eat some more, sleep and do it all again! Just thinking about it brings a huge smile to my face! It was truly a trip of a lifetime! I can very strongly recommend it.